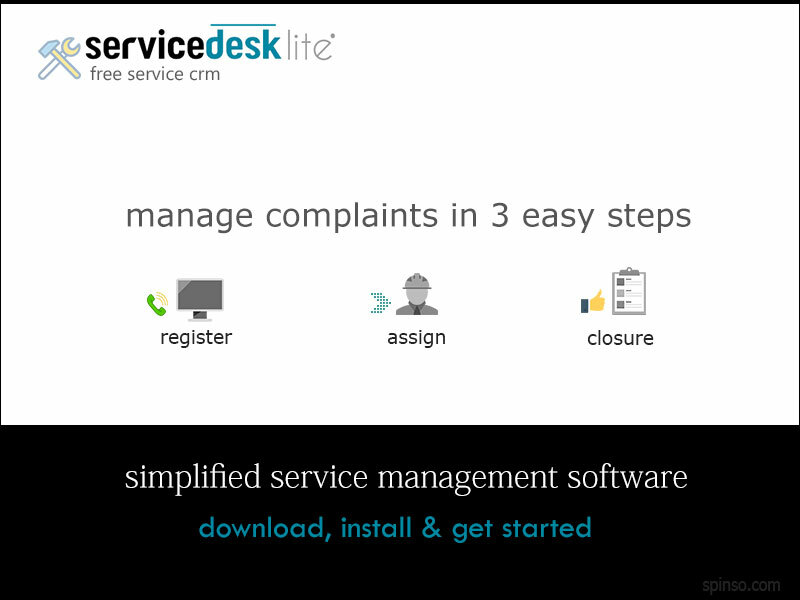 ServiceDesk Lite is free ready to use service management software that enables you to manage customer complaint life cycle from complaint initiation, assignment to closure in a very simple way.For service oriented firms it is very essential to timely respond to customer complaints, Usually lot of paperwork needs to be done to manage customer complaints.Service management is made simpler with Service Desk Lite.ServiceDesk Lite is useful for small service firms to systematically manage customer complaints so that it never goes, unattended.The features of ServiceDesk Lite includes Registering Complaint, Assigning, Closure, Reports, Excel Export.You may receive customer complaints from various sources, such as email, telephone, web etc.Tracking these complaints enable, you to resolve issues in time, and quickly respond to customers.In Service Desk Lite you can record essential details related to complaint such as the customer contact, caller details, complaint description.After complaint is received it is assigned to service executive.Assigning complaint to service executives ensures every complaint is attended.It also helps to analyze and promptly allocate complaint to the service personnel.Complaint assignment in ServiceDesk Lite is quiet simple, you get the pending list of complaints that are yet to be assigned.Complaint Closure is last stage in complaint management that enables you to track the status of complaint i.e. solved or pending.Tracking status enables you to identify the complaints that are open or not resolved and take timely actions.It also helps you to determine the service performance.You can track details such as status of complaint, measures/action taken to resolve the issue.The data in ServiceDesk Lite is stored on your local machine, hence it is faster&easier to access.ServiceDesk Lite is absolutely free without any limitations. No registration required. Download, Install&Get started instantly. iPJC is an easy-to-use record keeping system for the land surveying industry. It allows your staff to securely store, retrieve and cross-reference all of your company's survey database records - of plans, jobs and contacts - using their web browsers.